I have an Oki MC342 that works wirelessly. There are no letters after the number on the machine itself but there are letters after the name on the toner cartridges. I've not yet had to replace the cartridges so haven't bought a set before. I could do with a full set of four (the black is out completely) but don't know which to order. Can you help? Thanks. Are used / empty MC342dn cartridge cases returnable and is there a value? We have an Oki MC342 printer. Can you advise which black toner cartridge we will require as your website seems to specify for MC342dn printers. Ours is not a "dn"? This versatile multifunction colour printer is designed for SOHO environments that need a space-saving yet cost-effective solution for producing high quality documents. The Oki MC342dn A4 colour multifunction printer simplifies some tasks like mobile printing and network connectivity, but mediocre print speeds and noisy operation make it less efficient. 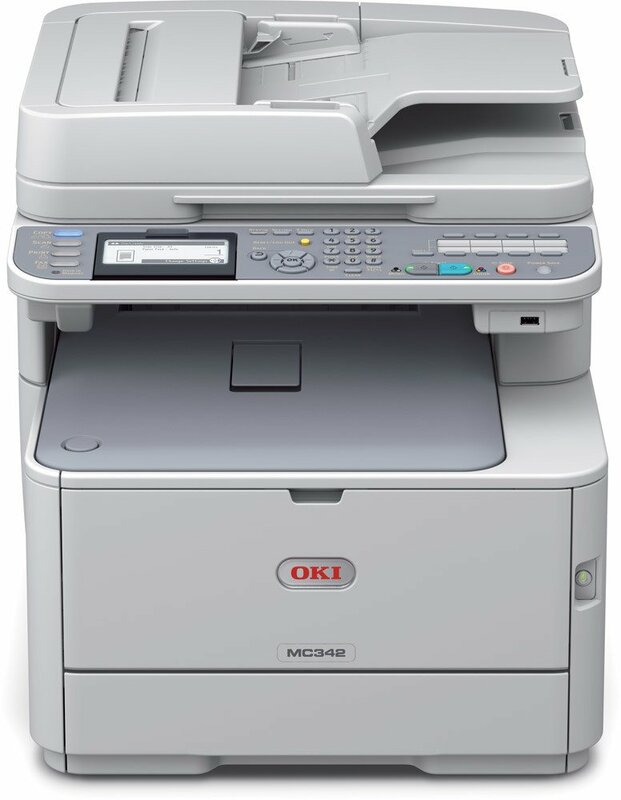 The Oki MC342dn A4 4-in-1 colour MFP uses digital LED technology for energy efficiency and reduced running costs. The simple yet universal frame of the Oki MC342dn colour laser printer weighs 29Kg and measures 509mm deep, 427mm tall, and 444mm tall. Its processing speed is 533MHz as the MC342dn printer runs on 256MB of RAM. Paper capacity is 350 sheets with two trays and a 50-sheet reversing automatic document feeder. Connectivity is via two USB 2.0 ports and a 10/100 TX Ethernet, while on-board operation can be done from an alphanumeric keypad with navigational buttons, one-touch buttons, and a blue backlit graphics LCD screen. Superb quality colour output can be produced by the Oki MC342dn LED printer because of auto colour balance and a photo enhance driver, while monochrome output is produced in speeds of up to 22ppm without compromising sharpness and accuracy, making it suitable for printing barcodes. Auto duplex and RADF are standard to save resources. The MC-342dn multifunction printer is compatible with mobile printing and supports a wide range of media types, enabling users to print booklets, DVD or CD labels, and banners. Affordable Oki MC342dn toner supplies ensure that this machine is cheap to run as far as laser printers are concerned. The Oki MC342dn laser multifunction printer is noisy and slow when printing in colour. Grainy images are produced by the copier. There are no options to expand the memory in the Oki MC342dn MFP, so it tends to be sluggish when processing complicated and high-resolution output. PC fax is not supported, and the scanner lacks updated drivers.